Originally published under the title "Turkey's Grisly Dances with the Islamic State." The largest terror attack in Turkish history targeted a peace demonstration. On October 10, Turkey woke up to the worst single terror attack in its history. The twin suicide-bomb attack in Ankara killed 97 and injured nearly 250 people, with more than 60 of the wounded being treated in intensive care. As of October 14, no one had claimed responsibility, but all indications pointed to the Islamic State (ISIS, or IS)—the same jihadists Turkey's Islamist government once helped logistically, in the hope that they would facilitate Syrian President Bashar al-Assad's downfall and the establishment of an Islamist regime there. In fact, the attack in front of the main train station in downtown Ankara looked like a bigger-scale version of a July 20 attack in Suruc, a small town on Turkey's border with Syria. A Turkish-Kurdish suicide-bomber with ties to the Islamic State murdered 33 people at a pro-Kurdish meeting in Suruc, and paved the way for a spiral of violence that has since claimed hundreds of lives. Actually, since most of the deaths resulted mostly from Turkish-Kurdish clashes, the attacks may have claimed thousands: Kurdish militants' casualties remain unknown. Since July 20, more than 150 Turkish police and military officers have been killed. ISIS felt that Turks had not followed its call to "rise up and fight against these atheists, these Crusaders and these traitors." One of the two perpetrators of the Ankara bombings now is believed to be the brother of the Suruc bomber. The second suspect also has alleged ties with jihadist groups. 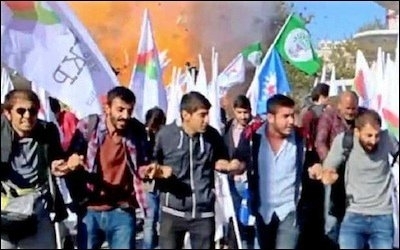 On October 10, thousands of pro-peace activists from different NGOs—most of them pro-Kurdish, secular, leftist and opponents of the AKP government—had gathered in front of Ankara's main railway station, to protest the wave of violence sparked by the Islamic State suicide-bombing in Suruc in July. They had no way of knowing that two other jihadists would turn their "peace rally" into a bloodbath. The usual police body searches for weapons or bombs—carried out routinely before every public rally—were omitted this time. Interior Minister Selami Altinok admitted that the body searches were not done, but refused to accept allegations of negligence. The murder of nearly 100 people in a terror attack is shocking wherever in the world it happens, or whoever commits it. But the Ankara attack was hardly a total surprise. This author has mentioned at least a few times the findings of an August 2014 poll, which found that 11.3% of Turks did not view the Islamic State as a terrorist organization. Eleven percent is in no way a marginal figure: If a "mere" 11.3% of Turks thought so generously of ISIS, it meant that there were nearly nine million Turks sympathetic to jihadists. And only 5% of that would mean an army of nearly 450,000. The two suicide-bombers on October 10 were most likely just a two of that big bunch of 450,000 or so sleepers inside Turkey. Apparently, the people of Turkey did not "rise up and fight against these atheists, these Crusaders and these traitors." So they had to be killed by jihadists in suicide-bombing attacks. IS promised to attack, and it did. 450,000 minus two (suicide-bombers) leaves behind too big a number. Turkish cities are unsafe. Turkey's Islamist leaders look appalled to have been attacked by their one-time comrades. They should not. They wanted to dance with the devil in order to "Islamize" the failed state of Syria. The dance has ended up in carnage. It had to. 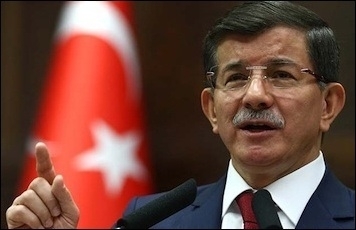 Prime Minister Ahmet Davutoglu suggested that Kurds or Communists might have been involved in the blast. Turkey's Islamist leaders once hoped that they would triumphantly visit Damascus when it would be Sunni Islamist, not Shia and secular. Instead, their former jihadist friends hit them right in the heart of their capital. But Ankara does not learn. Prime Minister Ahmet Davutoglu, instead of calling a spade a spade, mentioned three other organizations as potential culprits for the attack. In addition to the Islamic State, he said, other suspects were the PKK, the Revolutionary People's Liberation Party-Front (DHKP-C) and the Marxist-Leninist Communist Party (MLKP). These Kurdish and extreme left organizations mentioned by Davutoglu are big enemies of jihadists, not friends with whom to jointly organize a terror attack. Most victims were sympathizers of the Kurdish and leftist groups. Yet four days after the Ankara bomb attack, after the police had already identified the two suicide-bombers as Turkish sleepers linked with the Islamic State, Davutoglu still said that the attackers were linked with both IS jihadists and Kurdish militants. Davutoglu cannot admit that jihadists alone simply murdered people en masse in twin bomb attacks. The Ankara bombing was a bad ending of one part of the Turkish Islamists' willing dance with the devil. The dance is not over yet.